Crape Myrtles (or Crepe Myrtles) are one of the few blessings during the toxic summer North Texas Heat. Those beautiful blossoms of a plethora of bright colors are the only thing that looks like it is alive during those months. Those trees (or shrubs) are everywhere in Dallas and everybody loves them. In addition to the blooms, they have these beautiful branches – sinuous and almost animal – like. I have photographed and blogged about them before. You see this all over the city in the winter months. 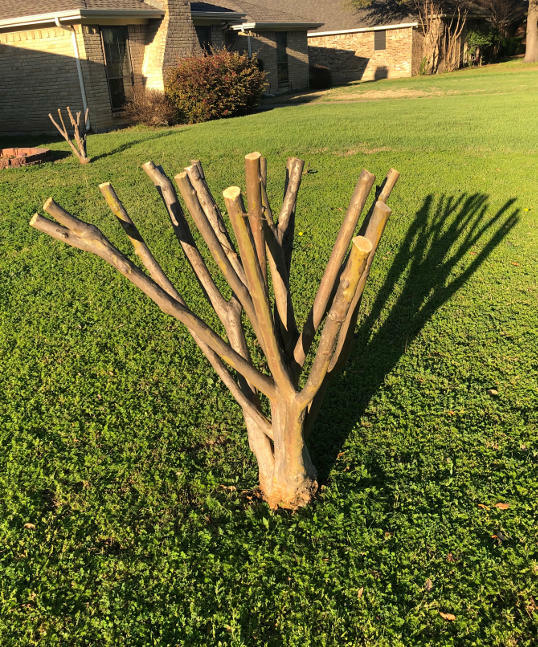 People chop the tops off their Crape Myrtles. It ruins them. They grow back with a cloud of ugly little branches sprouting out from the cut ends. I love crape myrtles. No flowering shrub that we grow rewards us so completely, yet requires so little care and attention. Then why must this barbaric chopping persist? THIS IS JUST NOT ACCEPTABLE! I have spent an entire career in Texas horticulture trying to get people to STOP TOPPING CRAPE MYTLES! I’ve seen progress in DFW, where many of us have been preaching this gospel. But in the rest of Texas and across the South, and still even in the Metroplex where I live, people are doing it. I have listened to seemingly every excuse in the world for this barbarism, from “My plant is too tall for the space that I have for it” to “It makes my plant flower better.” It’s all just so much hooey, and I hope you’ll forgive me if my eyes glaze over and my smile seems frozen. I’m thinking about something else. I am no longer tuned in to you. Whacking the plants back like this does not change their genetics. They’re still going to try to grow just as tall. Topping won’t stop that. All topping will do is leave the plants looking gnarled and ugly. If you have a crape myrtle that’s too big for its spot, either move it – or remove it entirely. 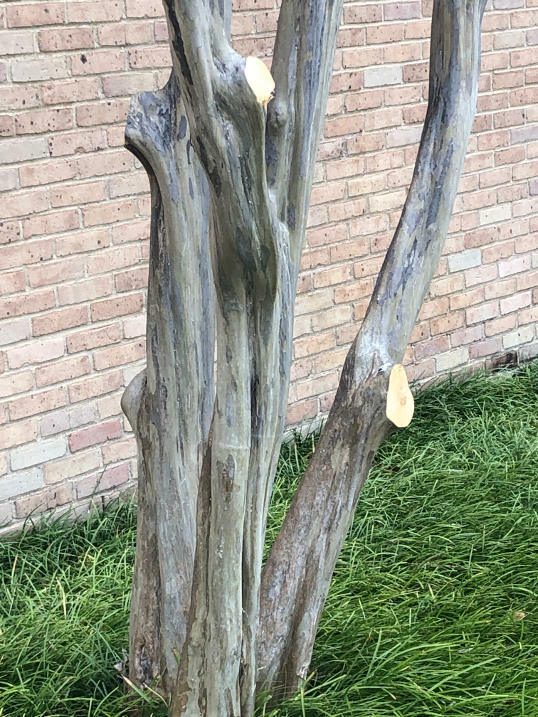 Don’t put it and yourself through the misery of topping your crape myrtle each year. I wonder why people do this and why it bothers me so much. I think the root cause behind both is the concept of Control. What more gratifying Control Of Nature act could there be than beheading your bushes? It must give some people a big rush to be able to cut back and restrict the growth of something so beautiful, innocent, and alive. And I have come, over my decades, to detest Control… especially blind, hurtful, and damaging Control. So there it is, I drive home from work or ride my bicycle through the suburban streets and am presented with these decapitated shrubbery, these beheaded bushes, these topped trees. It isn’t fun. The winter is bad… maybe the worst… or maybe it isn’t – the spring is horrible as the maimed, damaged, and deformed remains send out their shoots, trying to get back to normal – though they never will. The scars of their maiming are there forever in their distorted forms.